Bag tags are now available in eight kid-approved, fun designs and can help your child keep track of all of their bags. These name tags are made using material that is durable and plastic, similar to the plastic that is used to make credit cards, and up to four lines of text will fit on a single label, with as many as 15 characters in each line, including spaces. The designs range from tough camouflage, to a beautiful sunny landscape, and the name and other text fits near the center of the drawn design, so the tags serve a function, as well as adding aesthetically to your children’s bags. 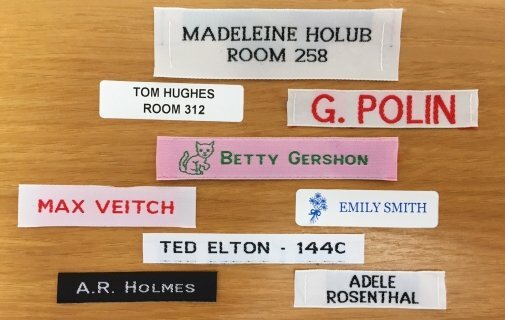 While these custom name labels will ensure that your child’s bag is returned, should it be lost, we still recommend ordering clothing labels, in case the items inside your child’s bag go missing separately. These labels are perfect for backpacks and duffel bags at camp or school, sport equipment bags, dance class bags, laundry bags, luggage, instrument cases, and more. The sturdy rubber band that attaches the tags to the bag are difficult to break, ensuring that the bag will be returned regardless of the strain that is accidentally placed on the tag. Each tag costs $6, but they are also available in one of the value packs at a discounted price. Select a background with your child, and then include any information that you would like on the tag. Most parents put at least a first and last name, but some also like to put an email or a phone number, so that the person finding the bag, should it be lost, knows how to return it.